Anna Thea Bridge, on her roof where she keeps her bees. Anna released some smoke into the hives, which, for unknown reasons, calms the bees down. On Memorial Day weekend she added a third “super” (a drawer, which she built herself) to the hive in the back. 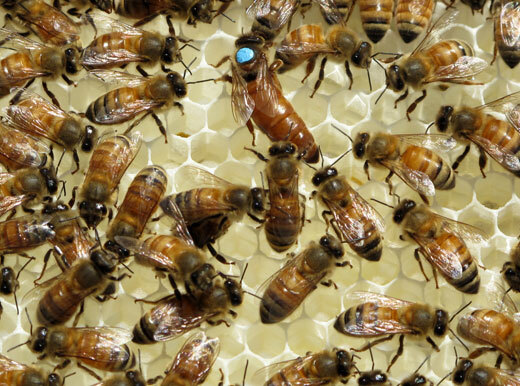 Queen Alice is much bigger than the rest and marked with a blue dot, according to the international bee color-coding system. See how everyone’s facing Queen Alice? The bees feast on the sugar water Anna poors into their hives. That’s me on the moon. Anna Thea Bridge has been interested in bees almost as long as she can remember. 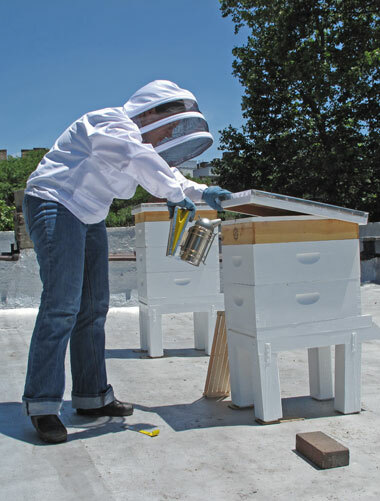 But only once beekeeping was legalized in New York City last March, did she install two hives on the roof of her house in Sunnyside Gardens. 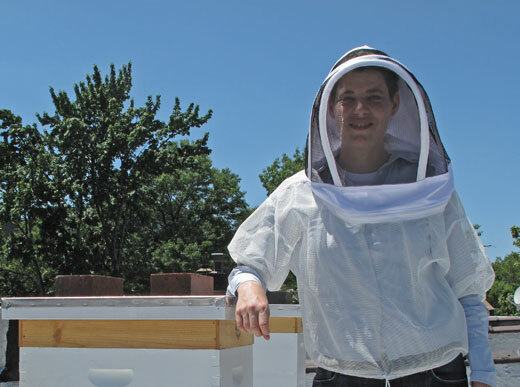 Beekeeping, Anna says, is so versatile that it is impossible to tire of it. “This month I might be interested in watching them bring pollen back and learning about different kinds of pollen, at another time in hive design and the history of different hives. It keeps your interest potentially for a lifetime,” she says. 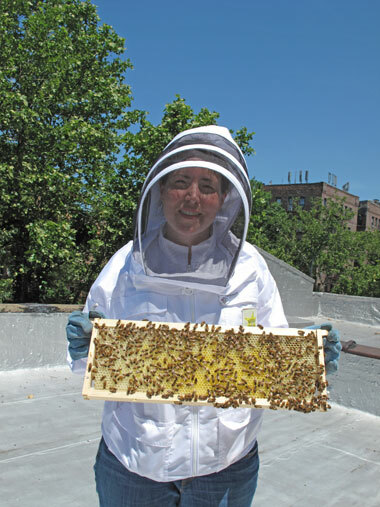 Currently, Anna enjoys how present and mindful she has to be when working with the bees. She compares beekeeping to meditation and Tai Chi. A litigation attorney, Anna often works long, stressful hours. 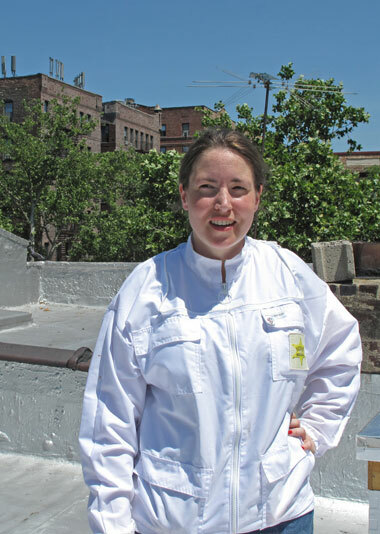 But on the weekends she puts on her beekeeper’s suit and climbs to the roof, where she moves thoughtfully and slowly to not agitate the bees. She inspects the hives, feeds the bees sugar water and makes sure that the Queen is happy and the hive has enough space. 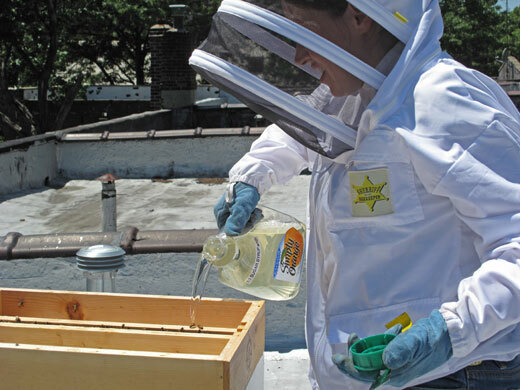 This Memorial Day weekend, Anna added another “super” to one of the hives. The supers look like drawers and contain several frames in which the bees store their honey. When it gets cold, the bees cluster in the hive’s center to keep warm, and some of the supers may have to be removed, because too much space is difficult for the bees to heat. Each of Anna’s hives houses up to 50,000 bees, mostly female workers and male drones, and one queen, the hive’s central character. Affectionately, Anna has named her first two queens Queen Alice and Queen Bernadette, their initials corresponding to the first two letters of the alphabet, presumably the beginning of a tradition. Each hive can produce up to 100 pounds of honey a year. Some of that honey will help to reward Anna’s neighbors. 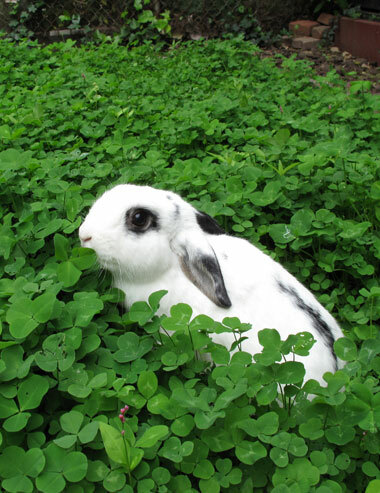 “They were nervous at first that there are going to be bees in their yard all the time. But bees have a three-mile radius,” Anna says. “And they don’t all leave because the queen is inside and they are bonded with her.” In fact, I was surprised how calmly the bees came and went while we were on the roof for Anna’s weekly routine. Sunnyside, with its linden trees, its abundance of flower boxes and its proximity to several cemeteries—bees love the patches of clover that grow there—is the perfect environment for bees. While Anna agrees that bees are wild creatures that have to be treated with deference and respect, she also thinks that their virtue is underestimated. “People don’t really think about pollination but it’s really important,” she says, mentioning the city’s recent push to plant more apple trees in the Big Apple. “If you don’t have any bees you are not going have any apples,” she explains. So if you see a bee in your yard or on the cemetery, be kind to it. Maybe attach a tiny little letter to its pollen sacks, thanking Anna for helping to pollinate Sunnyside’s flowers and fruit trees. In return, you will soon be able to buy “Sunnyside Honey” at the local farmers market. In the podcast Anna talks about the perks of beekeeping and her decision to buy a house in Sunnyside. 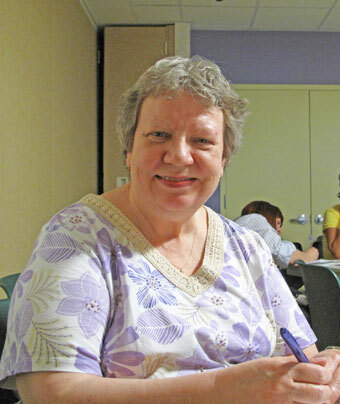 “I originally lived in Sunnyside with my parents back in 1959 until 1966, and in 1996 I moved back on the same block. I love my neighbors. I would like it if people knew each other by name and greeted each other. I love the yard across the street, which is like having a little piece of countryside when I look out of my window. In the winter the snow on the trees glistens. 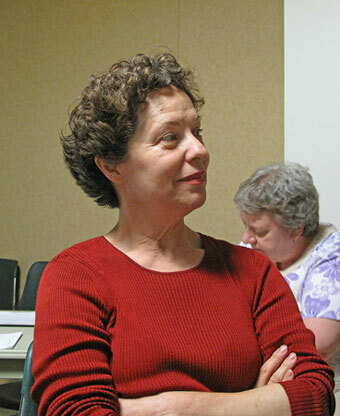 Corinne was interviewed by Leonore Lanzillotti at the Sound Project workshop at the Sunnyside Library. She talks about some good and bad things that happened to her in Sunnyside when she was a child. “I have lived in Sunnyside since 1972. There was a time when my husband and I thought we’d have enough money to live in Manhattan, so we checked all our best choices and after two days we decided that Manhattan was too crowded, noisy, impersonal and had no big grocery stores. So we realized we already lived in the best neighborhood in New York. “Because of a power outage on the 7 train I met a woman who has lived one block away from me for the last 35 years. We are now fast friends. 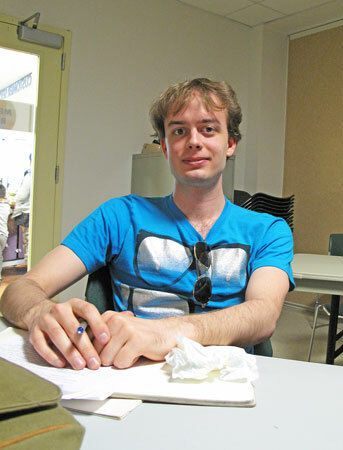 Tristian took part in my Sunnyside Sound Project workshop at the local library. An artist, Tristian brought a copy of one of his paintings to the workshop. “My parents are Polish American, and my dad used to work in Saudi Arabia. When I was one year old, my parents made the decision to move back to their nice apartment in Sunnyside. They wanted my sister and I to have a good New York City education. I consider myself to have spent my whole life here. I consider Sunnyside to be my personal refuge from Manhattan. Here I feel comfortable to relax in sweatpants. (I don’t have sweatpants but it’s the idea of sweatpants.) I feel safe to walk all around the neighborhood. I have a strong sense of pride for Sunnyside, but know that I am very detached from the community. I can count my Sunnyside friends on one hand. 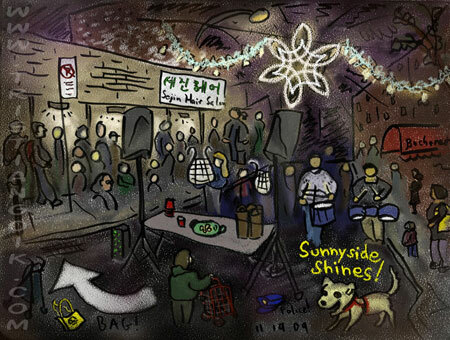 I am happy to just hang out with friends in the city and say, “Oh, I live in Sunnyside,” and smile. Tristian was interviewed by Tony Rohling. Yolanda emmigrated from Colombia in 1978. She has moved away from Sunnyside a couple of times but always found herself back. Among the things Yolanda appreciates most about Sunnyside is its safety. Yolanda, who was interviewed by Corinne Healy, tells us the most terrifying and astonishing thing that has happened to her in Sunnyside: In 1992, her nine-year-old son fell from the roof of her apartment building and survived.